True freshman QB Seth Collins will not play vs. Utah. 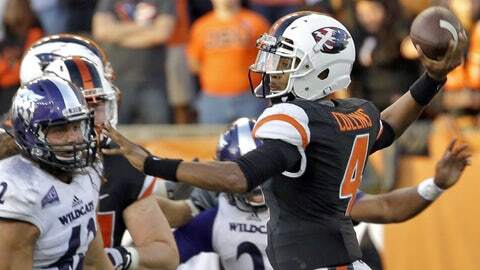 Beavers true freshman QB Seth Collins will not play on Saturday afternoon versus Utah in Salt Lake City, according to a report by The Oregonian. Collins suffered a knee injury in practice on Thursday and did not travel with the Beavers to Utah. Collins was expected to split time at QB with redshirt freshman Nick Mitchell against the Utes. Without Collins available, Mitchell will get the start. Last week Mitchell made his college football debut against Colorado, completing 9-of-24 passes for 122 yards and an interception while splitting time with Collins. The severity of Collins' injury is not yet known.